This pattern is available from knitnowmag.co.uk for £3.00. Due to changes to EU legislation with regard to Value Added Tax liability from 1st January 2015 I have decided to temporarily suspend pattern sales until it becomes clear what the best option for me will be. I will also be using this opportunity to develop some new patterns, revise layouts, make any amendments and take some new photos. I haven’t set a date for reopening my Ravelry store but it’s unlikely to be before early summer 2015. If you’d like to be notified when I reopen send my a personal message and I’ll add you to a list for earburning when I reopen. 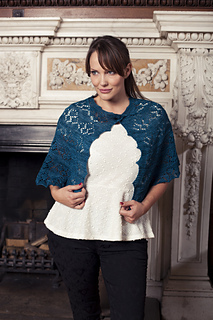 This pretty capelet, featuring a geometric lace design, is a great knit for spring - it’s perfect for covering up over a nice dress. The Horae or Hours were Greek goddesses of the seasons, natural justice and the general orderliness of life. There were different versions of the Horae – some related to justice and order, some to seasons, and some to the passing of the hours through the day. The stitch pattern in this capelet is based on the Four Sisters Medallion from Barbara Walker’s 2nd Treasury so I chose the name Horae to reference these mythical sisters of the Ancient World.